Ann Sothern was Maisie Ravier, a sassy and street-smart American working woman turned woman of the world.That's in the best sense of the words, of course. MGM Studios had created the series of ten motion pictures based on a brash blonde with a heart "of spun gold." Maisie, the first in 1939, was from the book "Dark Dame" by the writer Wilson Collison, who did decades of scripting for the silver screen along with Broadway plays and magazine fiction. From the first, MGM wanted Ann Sothern to play Maisie. She began in Hollywood as an extra in 1927. "Maisie and I were just together - I just understood her," Sothern, born Harriette Arlene Lake, said after several of the films made her a star. Throughout the 1940s, the Maisie pictures continued to be released every couple of years. "Your pictures pay for our mistakes," Arthur B. Mayer told her. "And you'll just keep making Maisies as long as you do that." In July, 1945, Ann took Maisie to radio in a half-hour weekly radio. 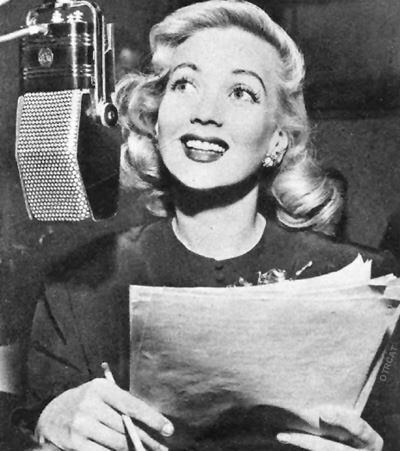 Famed radio actor Elliott Lewis co-starred as boyfriend Bill, with other parts going to such seasoned radio players as John Brown and Lurene Tuttle. The series ran two seasons, and was revived in 1949 as a syndicated program, now called The Adventures of Maisie. Included in the repertory cast were Hans Conreid (later on Life with Liugi), Sheldon Leonard, Joan Banks, Elvia Allman, Bea Benadaret, and Sandra Gould. The old time radio show continued in the tried and true Maisie tradition of one part adventure of the emotional kind, one part romance, and one part laughs. To the end Maisie was the single girl, as this allowed her to get involved in continuing adventures of many kinds. These radio adventures of a liberated American "dame" from Brooklyn were tailored to post-WWII, and featured Maisie making her way (and having her way, most of the time) on both sides of the Atlantic. Maisie's favorite comment - "Likewise, I'm sure." Sothern, due in great part to the Maisie films type-casting, would ultimately admit she was "a Hollywood princess, not a Hollywood queen." But in its time, the Maisie series in film and on radio made her known and loved the world over. And for many of us, Ann Sothern was a beautiful and intelligent actress whose warmth and charm were singularly beguiling. She continued to do TV (Private Secretary, The Ann Sothern Show) and movie work (A Letter to Three Wives, '49), and was nominated for an Academy Award in 1987 for The Whales of August. She died March 15, 2001. Be the first to comment on "Maisie"